You think you have persistence and determination? Most gardeners do, but most gardeners feel a bit overwhelmed soon enough after fighting with Bermuda grass. Here is one of the reasons it can be so difficult to get a handle on! A Bermuda grass root has pierced this little bit of wood with apparent ease. The roots not only can grow through wood, they have been reported as deep as four feet! 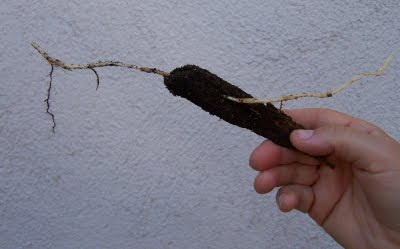 Along the length of the root, there are frequent nodes, each node capable of producing a whole new plant! If you find a Bermuda grass root, you must pull on it gently, trying to find the ultimate end in order to leave no pieces behind that would respout the problem all over again. 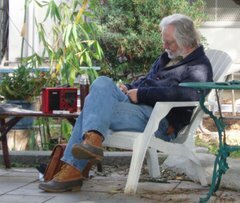 Such persistence makes even hardened organic gardeners think, "Herbicide, just one time, maybe?" But herbicide is the same seductress as heroin, fundamentally not changing the situation, setting one up to have to use herbicide again, while damaging the ecology of the planet (and your garden) and paying money to the people who would do that most harm of all to the planet and those of us who live here.